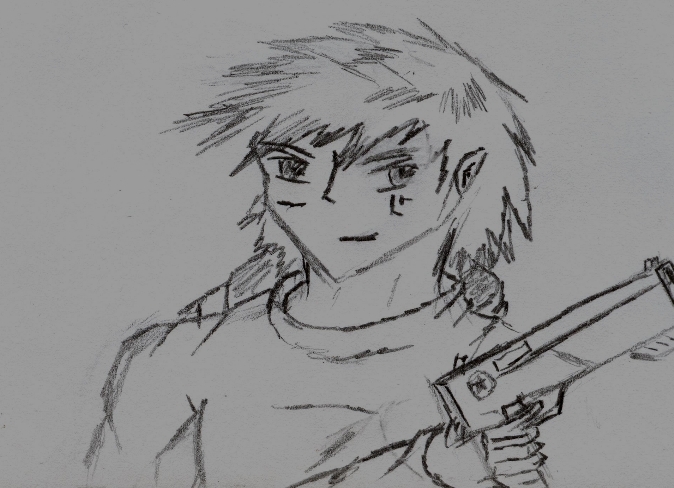 Kalco is a major character in the Reiko-10 story. He is a famed soldier who is assigned to the Reiko-10 base for a short stint under Zaier. He is confident and a bit of a braggart but has a endless well of combat stories he has lived through. He does not play the fool exactly, but is much smarter than he lets on, and uses this act as a way to see through the deception of others. Soon in the story of Reiko-10 he realizes the reason he is here is due to the similarity to a mission in the past where he was the only survivor out of two elite groups of soldiers. Kalco is the best. At least that is what he was constantly conditioned to believe. Never fail. Never give up. Never miss. Never, ever lose. Guide your unit to victory; you are unstoppable and the most skilled battle leader ever. Kalco suffered the same high degree of training all frontline soldiers endure, except as the future squad leader his training included a much more severe training. Neurostims, Sublim-suggestions, actually physical electrical stimulations, he was put through a lot for the one goal of making a unit commander who could take and distribute amazing amounts of punishment while bringing to bear the might of the unit behind him. He was good, and his unit was good; that was simply undeniable. So good, they brought the attention of a high-ranking intelligence official that believed his unit the only one capable of fighting a new threat. They wanted to try this alarming new threat against a group slated as the best. Of course, Kalco’s mission statement did not include anything of this nature. His unit thought it was something differently entirely. Thus his unit was taken completely by surprise, but still, they were the best. They won, but twenty-three of the twenty-five had died. The only two to survive was Kalco and a man named Braid. He heard Braid went on a killing spree, killing a substantial link up the command chain above Kalco, and was eventually caught and killed. The fact Braid was dead left Kalco as the only survivor of the encounter; that fact was perhaps even more dangerous then the initial event. Such valuable experience such as his was all too important to not put back into use. When they ‘offered’ this opportunity to Kalco, he couldn’t resist. He wouldn’t fail. He would triumph again. He was the best. Naturally. Personality: A strong, cocky man that has one thing most cocky people lack; an amazing set of skills to back it up. Kalco is damn good, and has no problem letting anyone know that is the case. He is a loud, boisterous man who jokes loudly, and chases girls as much as he can with Laina constantly watching him. Kalco is under the impression he is the only one in this surviving group of ten people that actually knows what he is up against. That belief is mistaken, but he does not know it. Thus, an of his interactions are colored with a slight joking-tone to them as a mask to cover the true darker reality to the matter they are all in. Despite his arrogance, the fact is that Kalco inspires a degree of respect by those around him, he truly believes in leading from the front, and would never send someone to do something he hasn’t already done himself. He feels extremely guilty about how many of his men and women died in his last encounter with this infection strain. He couldn’t bear the guilt of having anyone die under his watch. But that being said, he has no problem being the hero that saves everyone. He is the best. Remember? Of course you do.